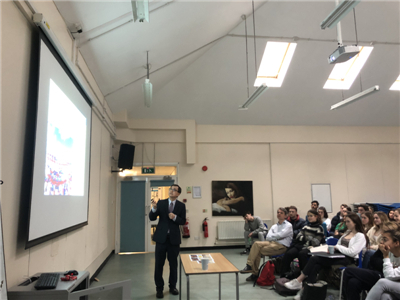 Earlier this month, Counsellor Guo Chentao of the Chinese Embassy gave a lecture on China’s development and the Belt and Road Initiative (BRI) at the Camden School for Girls in London. Nearly 100 pupils aged from 16 to 18 participated in the lecture. Relating his own story that showcases his hometown’s development due to better infrastructure connectivity, Counsellor Guo briefed the pupils on the origin, scope and impact of the BRI, as well as the latest progress of China-UK cooperation in this regard. Then he took questions regarding the BRI financing, green development, third-party cooperation, and etc. In answering the pupils’ questions, he shared his views on China’s history, culture and current economic situation. 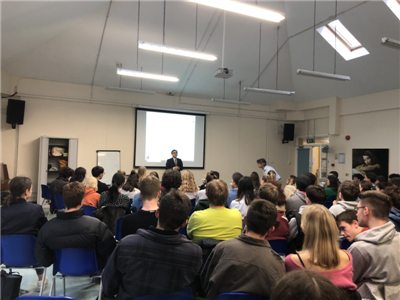 Following the lecture, the pupils had a further discussion with the Counsellor, expressing appreciation for the interesting and informative lecture which deepened their understanding of the BRI, and hoping for a closer UK-China cooperation on the BRI. Founded in 1871, the Camden School for Girls provides education to around 1,000 boys and girls aged from 11 to 18. It was named as one of the top 100 best performing schools in the UK by Schools Minister David Laws in 2013.